Trial Area B166 Internal roof section to amenities section. The internal roof section has been previously coated with a metal primer (type unknown). Some breakdown is evident with patches of corrosion at various locations. The breakdown areas and corrosion product were removed by hand cleaning to achieve a P St2 standard then primed with a zinc phosphate primer coat. All furniture had been removed from the area in which the Temp-coat 101 was to be applied. The walls were sheeted with heavy duty polythene sheets and the floor area was covered with cardboard and held together by duct tape. All un-removable items were masked to prevent over spray contamination. The coating sprayed very well using the DeVilbiss spray gun with a 2.8mm tip fitted; the rate of application was comparable with that of conventional spray painting. The rate of application and spray pattern was determined by the pressure of the spray unit, which was set by judging the flow rate from the spray gun. 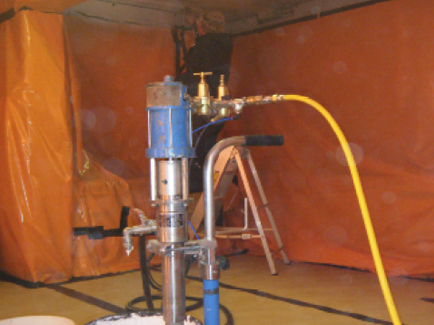 An unbroken stream of product is desired at a steady flow rate that was determine by switching off the air to the gun and adjusting the spray unit pressure until a steady stream was achieved. 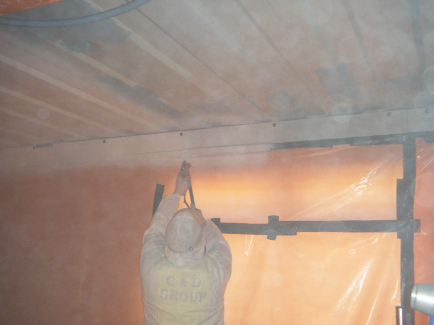 A coating thickness on average of 1mm was achieved in two coats, with a coating interval of approximately 1½ > 2 hours. Overspray from the spraying technique used also became an issue as a spray missed soon developed making visibility poor. No extraction equipment was used at this time but if this product is used for internal application in the future then extraction equipment should be considered. It took approximately 4 hours to complete the ceiling section, 2 hours per coat excluding overcoat interval. The finished coat appeared to be defect free other than some minor overspray contamination, uniform with a matt, off white finish. 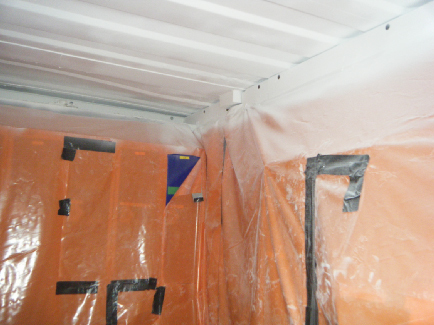 Although some further assessments are required before determining the suitability of the Temp-coat coating system, it was obvious that some initial applicator training would be required. The roof section has been monitored on several occasions after the initial application of the Temp-coat system to determine whether the Temp-coat system had cured the condensation problem. 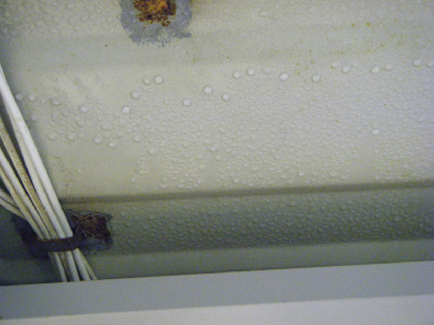 To date there has been no evidence that the condensation has returned. However this is an initial trial that was carried out in favourable conditions and worth noting that further assessment should be carried to determine its ability to perform in other environments. The other main observation was that some initial applicator training would be required. There is an applicator technique needed to be able to apply the product to the recommendations of the manufacturer. Knowing the reasons why low pressure spraying is desirable and the techniques needed to achieve a uniform finish is paramount to the success of the coating. The product is water based and seen as being environmental and user friendly as there are no VOC’s to contend with. Although its insulating properties are well noted in the sales documentation supplied, it would be worth carrying out further trials to determine its thermal insulating properties. 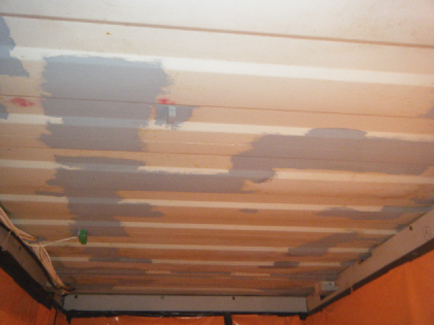 Further trials in varying conditions and to differing substrates would be desirable to determining the suitability of the Temp-coat coating system. This initial trial of Temp-coat has proved to be successful and appears to of achieved what we were told it would. It is worth testing the Temp-coat system under other conditions and to different substrates to determine its limitations. The one area where it is likely to have greater benefits is from its thermal insulation properties. 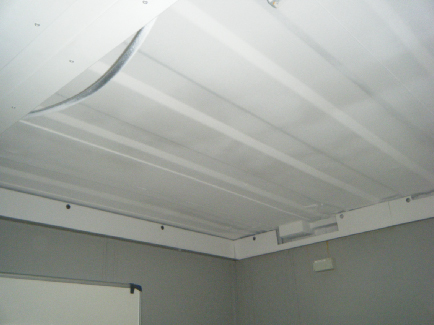 It can be used instead of insulation in some circumstances and in others help reduce insulation thicknesses. Because of its liquid form it does not need special fixings to keep it in contact with the substrate and provided the substrate is suitably cleaned and primed there should be no issues from corrosion or with its ability to provide a thermal insulation barrier.